The avant-garde don’t think of changing the apparatus, because they fancy that they have at their disposal an apparatus which will serve up whatever they freely invent, transforming itself spontaneously to match their ideas. But they are not in fact free inventors; the apparatus goes on fulfilling its function with or without them; the theatres play every night; the papers come out so many times a day; and they absorb what they need; and all they need is a given amount of stuff. Honest expression becomes production, and then “art is merchandise.” It is the same dishonesty that can take place in any creative industry (especially when we view them as such), because when we employ theatrics and/or music without a fair degree of tactical design to ensure the work is not co-opted by the apparatus, it becomes another product. Brecht also writes about irrationality and pleasure inherent in opera and the provocative effects which still draw our attention. I’m reminded of Frank Zappa’s fantastic rock opera Joe’s Garage, a bizarre, sprawling 3 act work touching on censorship, sexuality, cult religion, and the music industry, released at the same time as the Iranian Revolution (Ayatollah Khomeini banned rock music from the country), and as a precursor to Zappa’s later battles with the PMRC. Four years ago Hollywood’s Open Fist Theatre staged a sold out, fourteen week run of the production. Being a composer who didn’t particularly care to satisfy anyone’s standards but his own, it’s surprising to note that during live shows Zappa would employ what he called “enforced audience participation” at his live shows, in which people would do things asked of them from the stage (such as jump up and down, and recite a poem during one show in the UK). This wasn’t mandatory, but Zappa (as the composer and head of the band – musicians were considered his employees and went by the script most of the time) freely broke any “fourth wall” during the show’s theatrics. In many ways this is Zappa’s philosophy: from his earliest recordings Zappa has been mocking and critiquing the unearned privilege of the beautiful people. This flat-out statement of contempt for the beautiful, and the realization that the ugly have an unacknowledged power, is important in understanding both Zappa and his fans. As an way to impart the skill to handle that weapon, Operación Alfabetización Integral gave rural Peruvians various types of literacy. These went beyond basic reading and writing (which we take for granted when we hear the term literacy) and included the the ability to speak in non-lingual mediums. Those abilities allow individuals to impart non-linguistic forms of meaning on core values relating to their identity, belief and way of life. Boal also provides an outline for “transforming the spectator into actor” through increasing levels of mastery of technique, medium, and production that leads to a final stage of “the theater as discourse.” Spectator-actors create “spectacles” as per their “need to discuss certain themes.” A contemporary, well mediated example of this would be Reverend Billy (and the Church of Life After Shopping or Earthalujah). Reverend Billy and his group often maintain an identity as a evangelist and his choir, holding revival meeting-styled performances in public spaces, whether on the street or in shopping department stores. They “preach” and “sing” messages of anti-consumerism, perform exorcisms and so on. They’ve also “cast out demons” for Deutschbank, Bank of America, BP, and other corporations, in an satirical-interventionist style akin to The Yes Men. But the church format works well for involving audiences in all sorts of locations. Most people have seen a street preacher before – but very few have seen an activist impersonating a street preacher talking about climate change or economic inequality. 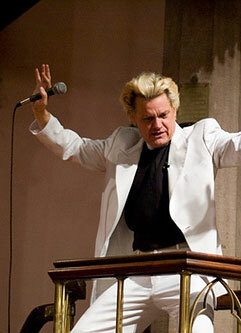 By employing a familiar, participatory format like “church” in the medium of street theater, Reverend Billy is able to bypass or deflect aversion one might hold to either practice. He also can include the audience through the church format by directly addressing them, encouraging hand clapping, asking for affirmation, and so on. It’s great stuff – better yet, it translates well to the internet, where the parody is not lost on those audiences. The recordings and rhetoric of Reverend Billy’s performance can be shared and fits will with whatever social media it’s sent through. If you haven’t heard Frank Zappa or Reverend Billy before this, I highly encourage you to check them both out. Zappa distorts the conventions of rock music for his own musical agenda, and Reverend Billy does the same to evangelical pretensions for his progressive causes. Also, don’t let that music in the video be the last you hear of Zappa – I appreciate what they tried to do in spirit, but the recording is terrible and the musicians can’t hold a candle to Zappa Plays Zappa or the original works. Bertolt Brecht. The Modern Theater is the Epic Theater (Chapter 13), Brecht on Theatre: The Development of an Aesthetic, 1964. Augusto Boal, Poetics of the Oppressed: Experiments with the People’s Theater in Peru (in Chapter 4), Theater of the Oppressed, 1985. Max Horkheimer & Theodor Adorno, “The Culture Industry: Enlightenment as Mass Deception,” in Meenakshi Gigi Durham and Douglas M. Kellner, Eds., Media and Cultural Studies: KeyWorks, Rev. Ed., Malden, MA: Blackwell, 2001: 71-101. Lowe, Kelly Fisher, and Kelly Fisher Lowe. The Words and Music of Frank Zappa. Bison Books, 2007. This entry was posted in Media Studies general, Social Change, Theory and tagged Augusto Boal, Bertolt Brecht, civic media, media studies, Reverend Billy, tactical design, theatre, Zappa. Bookmark the permalink.